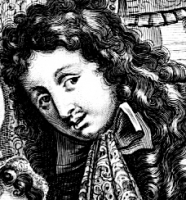 French composer Marc-Antoine Charpentier (1643-1704). He was a prolific and versatile composer, producing music of the highest quality in several genres. His mastery was especially recognized in the composition of sacred vocal music. A Baroque "in camera" for the classical theatre. Ave Maria: Madonna Mystica - Bach, J.S. / Handel, G.F. / Schubert, F. / Bruckner, A. / Brahms, J. / Liszt, F.